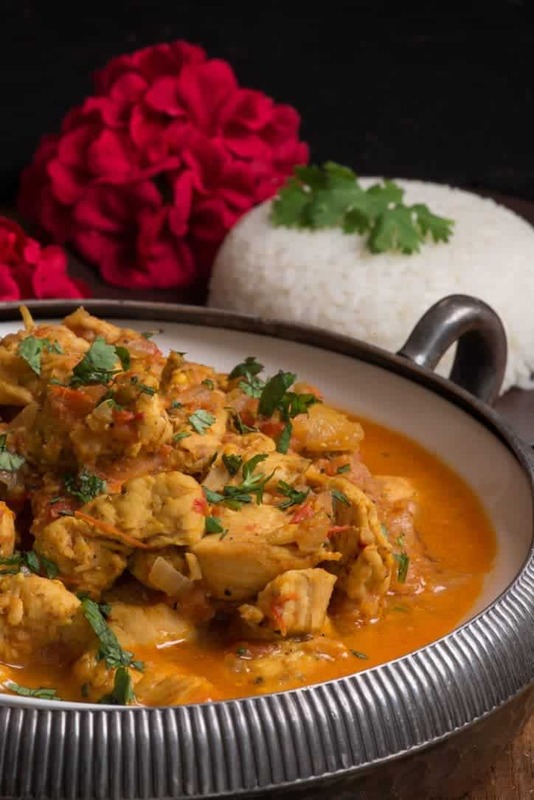 Nepali chicken tarkari is often served as part of a thali. This is where multiple dishes surround the rice and dal called dal bhat, that is considered the national dish. Tarkari can be made vegetarian with simply vegetables but we loved this version made with chicken. The process was easy and the result excellent. You first stir fry and then braise it resulting in a tender and juicy tarkari that goes excellent with the rice. You can make this as part of an authentic Nepalese meal or anytime for a quick and easy weekday meal. Honestly this has become one of my go to recipes, we love everything about it. Did you know that in Nepal they have a living goddess named Kumari? Kumari actually means virgin in Nepali and is the tradition of worshiping pre-pubescent girls as manifestations of the divine female energy in Hindu religious traditions. People gather around where the goddess lives and she is carried to a window where followers can get a glimpse of her. She is carried everywhere as her feet are not allowed to touch the ground. I had a chance to see her when I visited there and she was beautiful. I actually felt a little sorry for her as she was so young. It is however a great honor to be the Kumari for both the chosen girl and her family. 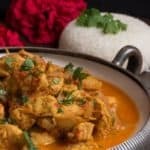 If you would like to learn more about Nepal be sure to check out “Our Journey to Nepal” , plus get more amazingly delicious authentic recipes. Mix together the turmeric, pepper and salt. Rub the turmeric black pepper, and salt all over the chicken and let marinate in the refrigerator, covered, for 30 minutes. In a small skillet over medium heat, dry-roast the mustard seeds for a few seconds, or until they are fragrant. Remove from the skillet and repeat with the fenugreek seeds. Be careful not to burn the spices. Combine the mustard seeds and fenugreek seeds in a mortar and pestle or spice grinder and grind into a coarse powder. Heat the oil in a wok or large saucepan over medium-high heat. Add the garlic, ginger, ground spice mixture, cumin, chilies, and bay leaves and stir to combine. Add the onion and saute until slightly translucent. Drop in the marinated chicken and stir-fry for 4 minutes, then add the stock and tomatoes. Bring to a boil, then decrease the heat and simmer gently for 30 minutes. Sprinkle with the chopped cilantro.